The S1000 has 100hp, the XP has 110hp. I'm trying to remember what the differences were that made up that 10hp difference, and curious if there are any simple upgrades to gain a little out of the S model. I'm not looking for huge gains, but if I can gain 10-20hp with some tuning and such it would be nice. I’m interested to see the responses to this. Though I’m new to the SXS world, with cars, outside of air intake and a slip-on exhaust (muffler) we should probably look a “packages” or “stages”. As you modify things it changes the overall stresses and dynamics. So, it very well could be that the recommendation would be a flashed ecu and clutch kit paired with exhaust and intake. As I mentioned, I could totally be wrong. I also think this is the lie I tell myself to buy more than one item at a time. So, anyone else feel free to speak to the exact changes in the motor from the S to the XP, and also my comments above are open for agreement or disagreement. I do agree that all of those things play a part, but i'm mostly looking at the engine. It's like a car, you increase power from the engine, but to fully get it's max you gear it for your intended needs. A jeep you can increase power, but you also gear it for the type of driving and such you will be doing. I am looking for the same. I am pretty happy with my setup, and will likely change some gearing to be able to "crawl" the rocks better, but first I want to see if there is a relatively low cost improvement we can get out of the engine. Is the ECU the difference in the XP or is there some internal changes to the engine as well? Once I see where the engine stands, then i'll look at gearing and clutches to apply that power as needed. The clutching is a little different, and the motor has more limitations on it from the factory because its a trail machine. Same with the 900 models. An ECU tune to get rid of the limiters and a little clutch kit can go a long way on the 1000 S.
"An ECU tune to get rid of the limiters and a little clutch kit can go a long way"
Does this apply to the XP1K also? Bikeman, AA, Evolution will get you some added HP with Tune and clutch. There will be a noticeable increase. Joey Strub Bmp likes this. Clutch doesnt add HP, it does add better performance and response. I'm looking mostly at engine only to start with. Is it possible, for example to get 110-120hp from the S1000 engine? Added HP is minimized if the clutch isn’t tuned to use it. AKA the Sweet Spot. And actually some units will benefit from a clutch kit only. Putting HP to the ground more effectively. I definitely agree, but am looking for engine first, then see how the clutch can maximize that. If the xp has 110hp, and the S only has 100hp with the same engine, there should be a simple 10hp increase hidden in there somewhere. I'm thinking it's just ecm tuning. If I recall some of the differences are Cam, head, throttle bodies. But yes ECU will likely get some of that HP. I wouldn't think Polaris would have that many separate components when they could just de-tune the ecm if they want to drop 10hp. But this is the type of info I am looking for. 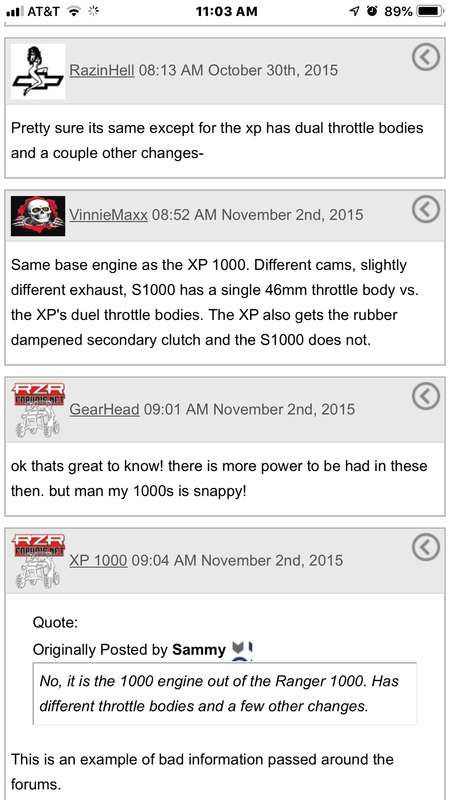 I think a person could compare the xp and 1000s by looking up the schematics parts list to narrow down the different parts. Bingo! Get the ECU tune and a clutch job! AA will do you right. Per the AA website, with their tuner ~$500 it is a 7-8hp gain with the tuner alone. That still doesn't get it to the 110 of the xp? Sure with a clutch kit it will put it to the ground better, but again I am looking at raw engine HP only at this point. Clutch kits do nothing but change the ratio and timing of how the power is applied to the wheels, primarily by keeping the RPM in a higher range (lower overall gear ratio) which is not what I am after. To be clear, I like to rock crawl and ride wooded trails usually below 15mph. I like the RPM to stay relatively low for these things (most clutch kits increase RPMs here), but if I can increase my HP a little bit, then I can also have a little more fun when I hit the dunes. I'm not racing, have no need to make my my machine scream on the top end. I am looking to keep the low end where it's at, just have a few more ponys when I do crank it up. RESEARCH. Add at Tune you’ll get 10-12 HP out of an XP!